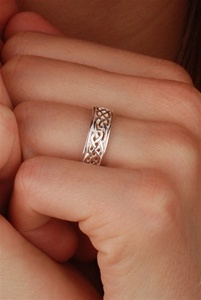 The best rings I've ever seen for husband and wife they fit perfectly, thank you so much for the greatest gift, we use them as anniversary presents for 25 years, love them love the Celtic style the whole thing, thank you for making such a beautiful item, and for those looking for beautiful gift item. My darling Murphy asked me to be his one and only on St Pat's many years ago. We still celebrate & he lets me pick whatever I would like as a remembrance of that special day. This ring was so lovely that I just had to have it. Been wearing it since it arrived and it is so smooth and comfortable. If you try it you will love it as much as I do. Thank you for making these beautiful items accessible to all.